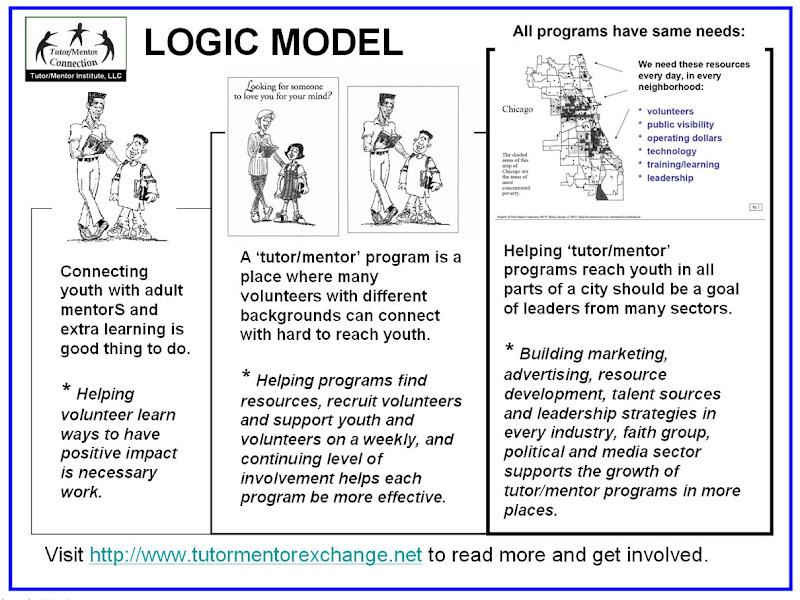 The Tutor/Mentor Institute, LLC was created in July 2011 to build tools and resources that would support the growth and operations of community collaborations like the Tutor/Mentor Connection in Chicago and other cities. The mission of the Tutor/Mentor Connection (T/MC) is to gather and organize all that is known about successful non-school tutoring/mentoring programs and apply that knowledge to expand the availability and enhance the effectiveness of these services to children throughout the Chicago region. Our goal is to help mentor rich volunteer-based programs become more available in all high poverty areas of Chicago and its suburbs…and to help those programs innovate ways to constantly improve their impact on youth and volunteers. Using information on the T/MC web sites leaders can build more effective programs, business and philanthropy can build strategies that provide more consistent support, reaching youth in more of the high poverty neighborhoods, and volunteers, parents and students can find programs where they might connect. Throughout the many web pages in this wiki and on web sites I host you'll find maps, illustrating all of the places in a city like Chicago where a wide range of k-12 tutor/mentor programs are needed. You'll also find graphics, illustrating what a tutor/mentor program might look like, how many years it takes to help youth move from 1st grade to first job, and how people from every industry, faith sector, university, etc. need to be involved in roles that support our mission. If you visit my page on Pinterest you can see many of these graphics. If you read the articles on Scribd.com or on the Tutor/Mentor Institute blog you'll see how these maps and graphics are included. 4) Improve flow of needed resources from community and industry leaders to individual tutor/mentor programs in every part of Chicago, and in other urban areas. The database of tutor/mentor programs enables parents, volunteers, donors, policy makers and media to identify tutor/mentor programs in different neighborhoods, while looking at the overall distribution of these programs in the entire region. The Tutor/Mentor Connection was created in 1993 to help volunteer-based tutor/mentor programs grow in the Chicago area. It operated as part of the Cabrini Connections site based tutor/mentor program, a 501-c-3 non profit until June 2011. It now operates as a program of the Tutor/Mentor Institute, LLC, which was created in July 2011 to support the continued work of the T/MC in Chicago and to help similar groups grow in other cities throughout the world.